In the 1890s Monitor Drill contracted with Joseph Hamilton to build approximately 13 houses for its employees on company property in an area that would become known as Skunk Hollow. It turned out that the houses had been built in a swamp and became known as “13 in the hole” for their constant flooding. There was a serious mosquito problem there as well, and concerns about malaria. 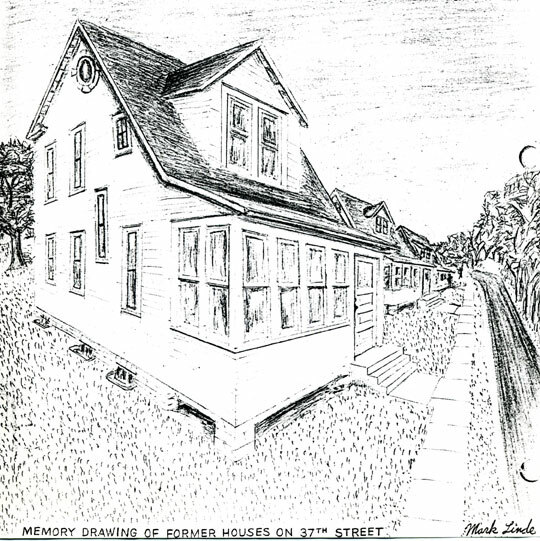 After about two years, in about 1894, the houses were moved up Goodrich to Colorado Ave. and 37th Street in the “Center” neighborhood, then also known as “Quality Heights” and now known as Elmwood. At that time, before the railroad tracks were put in in 1912, the map shows that Goodrich went through to Skunk Hollow. One current owner of one of the houses says that the homes were simply sawed away from their foundations. Initial purchasers of these homes included the Ainsworths, the Rehfields, the Yorgys, Joe Williams, H. Freeman, Oscar Hembre, George Williams, Larsons, Mead, George Wilbur and Homer Jones. Only a few of these homes are still standing. Many had to be demolished (including 6323 W. 37th Street and 3700 Colorado), and have been replaced by large modern homes that give “Quality Heights” an unusual mix of housing. Some remaining homes can be seen on the 3700 block of Colorado Avenue.